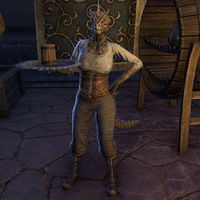 Spills-No-Drinks is an Argonian servant who can be found in Saint Delyn Waistworks in Vivec City. She cannot be talked to. This page was last modified on 2 July 2018, at 05:35.